Add a name to any item! Choose a size (the height) and color, message me the font! Easy peasy! * Please note, names such as Jessie May, Hollie Ann, Livie Jean, etc. Are considered two names so be sure to purchase two names please. You can also use a last name instead and use it for your mailbox, a travel mug for men, or a picture frame. ** If a font is not messaged to me, you will receive the font shown in Photo 1 in the photo slideshow. For other colors, check this out! +++ Font Shown in picture 1 (the gold names) Is Sugar Plums. My first order was prompt and prefect! My second order never came, no communication from the seller after FOUR emails! So you have a 50/50 chance. 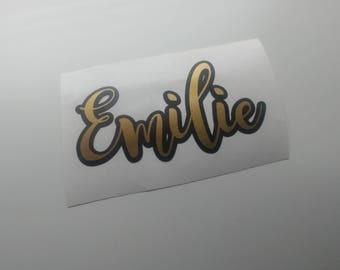 Loved my name decal! Will order again!! The Dude, The Man Behind the Beard, My Babe. If applying vinyl to cups, please handwash only. Vinyl decals are not suitable for clothing items. An attempt to iron a vinyl decal will cause the decal to melt. 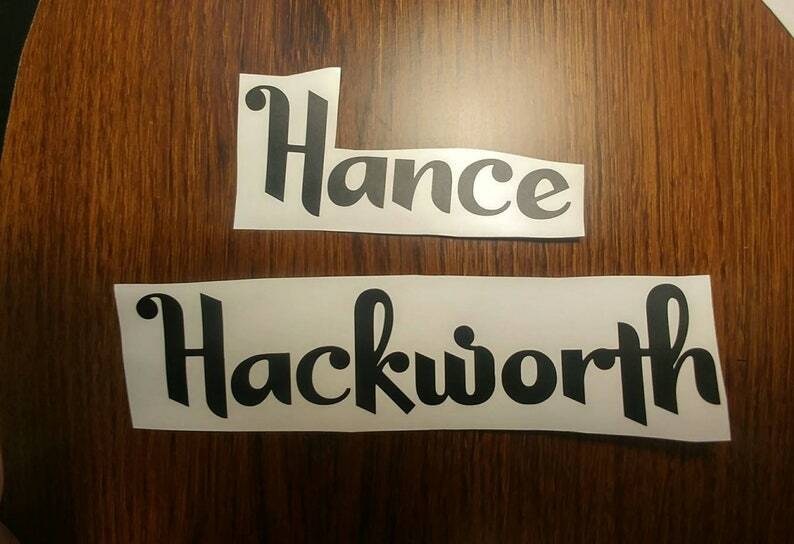 If you are needing iron on decals, please contact me for a custom listing and pricing. Any order that is custom is non refundable/non-returnable this includes all decals where you pick a size and/or color. It says my order has shipped, where is it? If it shows your order has shipped, it is best to check the tracking on USPS' website. USPS updates the tracking more frequently than Etsy. I never received my package or it is still in transit. If you never received your package, please check the tracking number. It will tell you where it is or if it has been delivered. Second, call the USPS 1-800 number. You will need your tracking number. This is something that the buyer has to do. As the seller, the information they give me is somewhat limited and its best the buyer gets the information from USPS first hand. If it is in transit, it is on its way.